When it comes to archetypal monsters, i.e. vampires, werewolves, zombies etc., it can be very difficult to bring anything new to them without rendering them so different they become unrecognizable. Are the running leaping monsters of 'Dawn of the Dead' (2004) still zombies? Do the glittery walking gods of ‘Twillight’ (2008) have enough resemblance to a traditional vampire (outside of marketing) to even call them that? At the same time it can be difficult to keep a story fresh when you have a character whose limits are extremely well known by the audience. Occasionally there is a film that manages to strike a balance between tweaking a traditional monster just enough to keep it interesting yet at the same time retaining those ideas that make it such a compelling concept to begin with. As a child, Etoile (David Rintoul) is left alone in the woods after his parents are attacked and killed by wolves. This same pack adopts him. 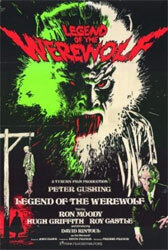 Later he’s discovered by a travelling circus and put on display as a ‘wolf-boy.’ As he nears adulthood, he finds out that he transforms into a werewolf during the full moon. After killing another circus performer, Etoile flees to the city where he befriends a zookeeper (Ron Moody) who gives him a job after displaying an affinity for the animals. Etoile takes a liking to one of the local prostitutes (Lyn Dalby) who have their afternoon lunch at the zoo. His overzealous crush on her and his feral nature start resulting in deaths with attract the attention of a local surgeon (Peter Cushing) who aids the police. It isn’t long before Etoile finds himself hunted beneath the streets of Paris. Although this film was not released by Hammer Studio, it contains a lot of the charm and atmosphere of those productions (thanks largely to Hammer alum Freddie Francis). There is a certain grimy low-rent feeling that works in perfect harmony with a story concerned about prostitutes, criminals, and showmen. Everything moves along at a healthy speed and the script is smart enough to let a little black humor into the story, mainly through Cushing’s delight in handling human remains, and the double entendre filled dialogue from the denizens of the brothel. The werewolf itself is a very interesting take on the monster. Its look is largely similar to the one in ‘Curse of the Werewolf’ (1961), but its origin is unique. Later on in the film it’s revealed that not only does it retain some of its human intelligence, but it can communicate as well. This is cleverly used to heighten the tragedy as things reach a climax in the sewers. The story follows a very familiar trajectory, if you’ve ever seen a werewolf movie you pretty much know where the story is going to go, but the film allows that certain doom to hang over its protagonist as a way of evoking sympathy even at his most feral and violent. ‘Legend of the Werewolf’ is a film that knows how to spice up what could be a very formulaic story just enough to elevate it above your standard monster fare.